Hatchling sea turtles smaller than the palm of my hand, and cute enough to warm even the stormiest of hearts, tumble onto the beach. A line is drawn in the sand to keep spectators at a distance, and the hatchlings scurry down the beach attracted to the ocean by the light of the setting sun. These tiny turtles are protected from the natural predators of land by our presence and poachers through our nightly turtle walks and eggs collection. 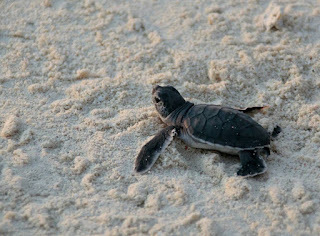 Yet, even with our protection, the onset of a sea turtles life is fraught with obstacles and dangers. The short stretch of beach leading to the sea is difficult to navigate, footprints present themselves like craters to the hatchling, some of whom must momentarily rest before they struggle up what must be a mighty staircase to their small selves. 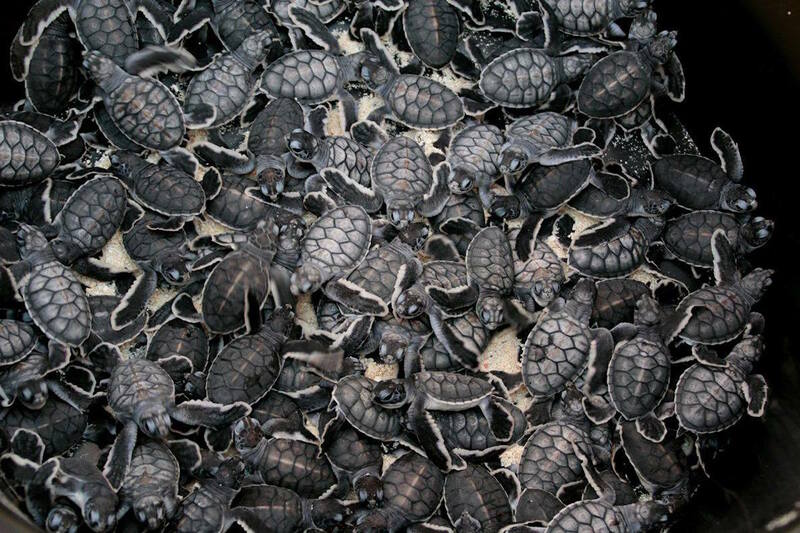 diminish, but the danger of the ocean and its predators increases– so much so that only 1 in 1000 hatchling turtles will reach sexual maturity. Just offshore ocean predators wait, even from the beach a barracuda is seen lurking in the shallows. The first task of a hatchling sea turtle is to find a raft of seaweed, which will provide a degree of shelter from harsh ocean conditions, and under which it can hide from predators. 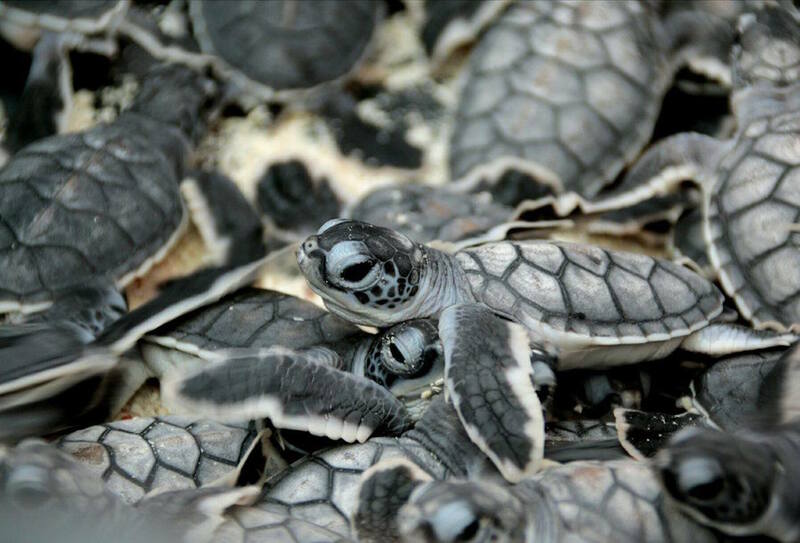 This refuge-giving raft also provides the fresh hatchlings a chance to rest and makes it easier for the little turtle to reach the oxygen it needs above the surface of the ocean. If it finds enough cover and has enough luck, baby sea turtles will float with the current in their seaweed raft feeding on smaller crustaceans and fish until the age of 5 or 6 and it is big enough to handle the open ocean. However, even at this adolescent stage the turtles are still small, roughly the size of a dinner plate, and subject to much predation. But if they survive the odds, Sea Turtles instinctively return to the beach on which they hatched when they reach sexual maturity at 35. Female turtles lay anywhere between roughly 250 - 700 eggs each of their season, meaning they will produce roughly 4 – 8 offspring throughout their life if they die by old age. For Pom Pom, with our many nesting turtles, and the many nests they lay, we estimate about 2000 eggs are laid each season – and we hope two more turtles from this seasons nesting will return to lay and fertilize eggs and make more hatchlings in 35 years. 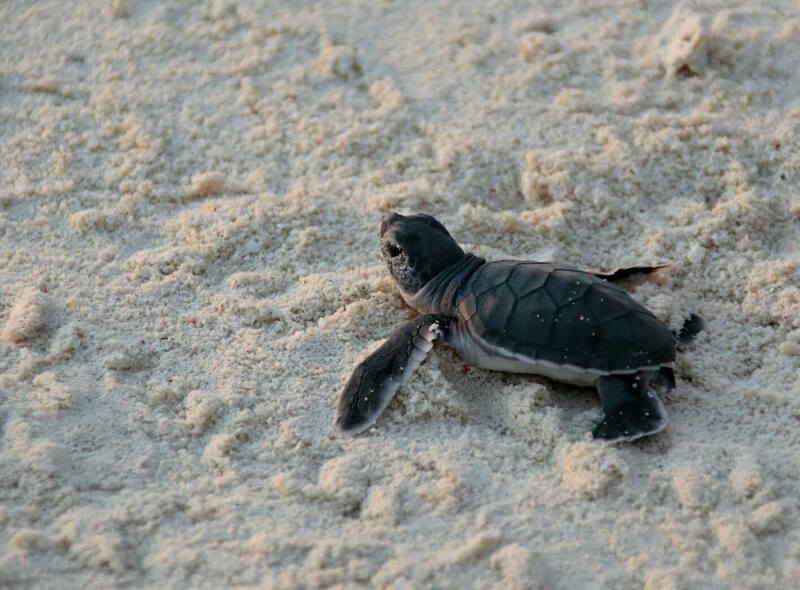 We cannot protect out hatchlings from the perils of the ocean, but we can protect the eggs from the danger of poaching, and offer the hatchlings a chance to test their luck and survival in the ocean.